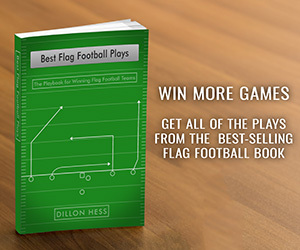 The success of the plays found on this website and on the Best Flag Football Plays Book is not dependent on the number or positioning of the lineman. These plays are made under the assumption that you can utilize lineman as blockers, and therefore, all the formations contain seven players on the field with 1 or 2 lineman plus a center. Some leagues may not even permit lineman, so depending on the rules of your league, you can disregard the lineman entirely. 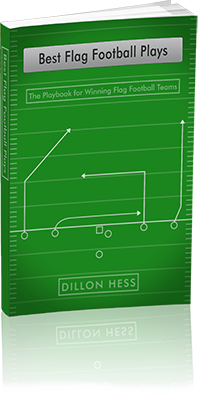 The focus of this book is on the passing game concepts of the Wide Receivers routes and the reads for the Quarterback. Flag Football games will have two different variations on the rules for blocking, deeming it either “contact” or “non-contact”. Some leagues will not allow any blocking whatsoever. When blocking is legal, however, it is typically limited to the chest. The lineman will shuffle there feet in order to stay in front of the defenders in order to keep them from reaching the Quarterback. The lineman are required to place their hands either behind their back, or clasped together in front of their chest without extending them out. The Flag Football Plays on this website, and in the Best Flag Football Playbook, are designed with both forms of blocking in mind. In games where blocking is allowed, the formations will provide both a center as well as one or two lineman. Upon snapping the ball, these players can be used to block the defense, or go out on passing routes, depending on the rules for the game. Either way, these plays will be beneficial for any form of Flag Football rules. Football is the ultimate team sport. That is why every position on the field needs to be aware of the overall strategy behind each play. From the quarterback to the lineman, the best way to get everybody on the same page is to clearly communicate the plays in the playbook to every player’s position. There is no better way to create your own plays then with a football playbook maker that enables coaches to specify instructions to every player on the field.